On Vogue's What I'm Wearing in April, Olivia Palermo posted this outfit. 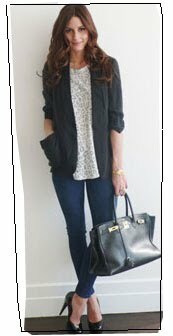 She is wearing a jacket, jeans and shoes, all from Topshop, and a t-shirt by Rebecca Taylor. I think it's great for exams - comfortable and stylish at the same time. I would probably replace the heels with a pair of comfortable flats, dark knee-high boots, or my current favourite - ankle boots. Add on a pair of dark-rimmed specs and we're good to go!